A smoke detector is a device that detects the presence of smoke, typically as an indicator of fire. Smoke Detectors that are properly installed and maintained play a critical role in reducing home fire deaths and injuries. 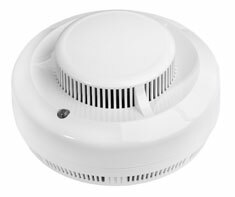 Smoke detectors (smoke alarms) generally come in two designs based on the type of smoke sensors they use: "photo-electric" sensors or "ionization" sensors. A photo-electric detector uses a tiny light source that shines on a light-sensitive sensor. The alarm is triggered when smoke particles from a fire breaks the beam of light. An ionization detector uses an extremely small quantity of radioactive material to make the air inside the smoke detector conduct electricity. Smoke particles from a fire interfere with the electrical current, and therefore triggers the alarm. Shown in the 'Routine Care' section are the recommended routine maintenance tasks for your smoke detectors. The 'Q & A' section shows answers to common questions. And the 'Articles' section provides helpful articles about your smoke detectors.